was easily be carried out, providing the ketol phosphates in good yields. metals commonly involved in such processes [1-10]. and its reaction with ketones were separated in two steps. 2 Y. PU ET AL. Table 1. 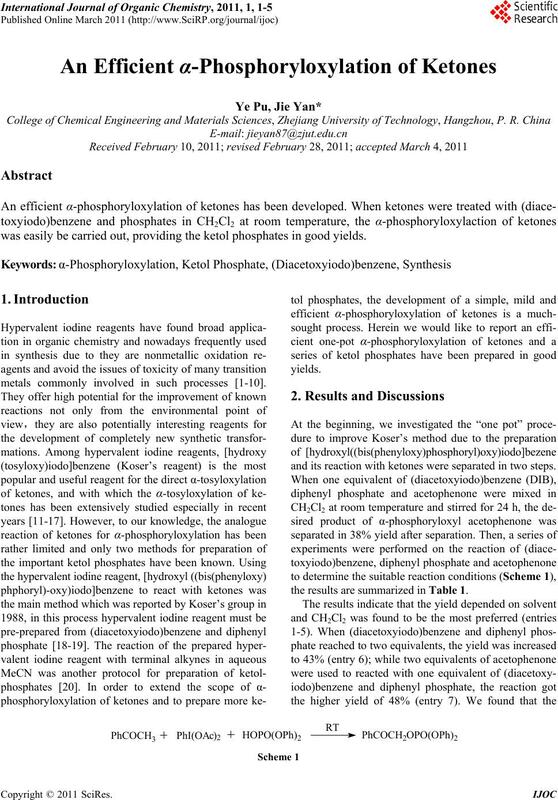 Optimization of the α-phosphoryloxylation of acetophenone. aIsolated yield; bMeasured by 1H NMR. , which is shown as follows (Scheme 3). Table 2. The result of the α-phosphoryloxylation of ketone. m/z, %): 369 (M+1, 3.5), 275 (100). 1024; MS (EI, m/z, %): 307 (M+1, 2), 250 (100). 4 Y. PU ET AL. MS (EI, m/z, %): 472 (M+, 2), 94 (100). HRMS: C22H21O5P calcd. : 396.1127, found: 396.1121. 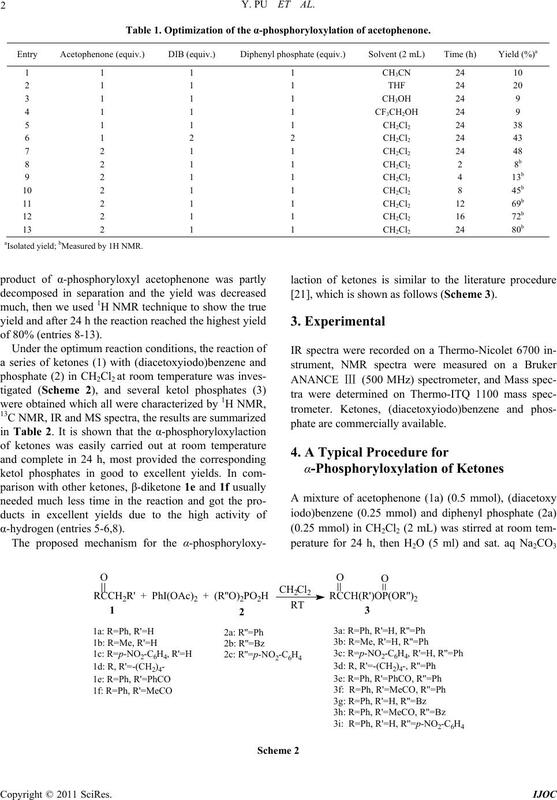 Hypervalent Iodine Reagents,” Tetrahedron, Vol. 53, No. Chemical Reviews, Vol. 102, No. 7, 2002, pp. 2523-2584.
try, No. 11, 1998, pp. 2267-2274. Vol. 611, No. 1-2, 2000, pp. 494-508. Chemical Research, Vol. 35, No. 1, 2002, pp. 12-18. 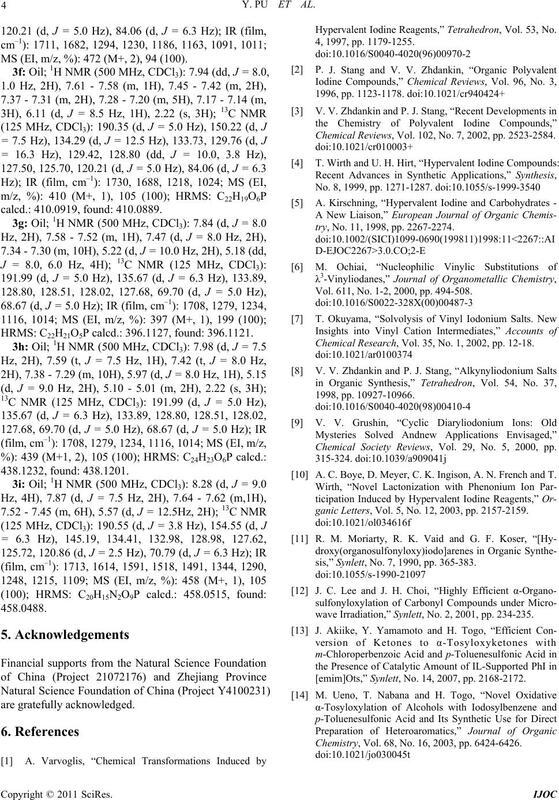 Chemical Society Reviews, Vol. 29, No. 5, 2000, pp. A. C. Boye, D. Meyer, C. K. Ingison, A. N. French and T.
ganic Letters, Vol. 5, No. 12, 2003, pp. 2157-2159.
sis,” Synlett, No. 7, 1990, pp. 365-383.
wave Irradiation,” Synlett, No. 2, 2001, pp. 234-235. [emim]Ots,” Synlett, No. 14, 2007, pp. 2168-2172. Chemistry, Vol. 68, No. 16, 2003, pp. 6424-6426. Tetrahedron, Vol. 63, No. 22, 2007, pp. 4680-4687.
cations, No. 16, 2009, pp. 2073-2085. 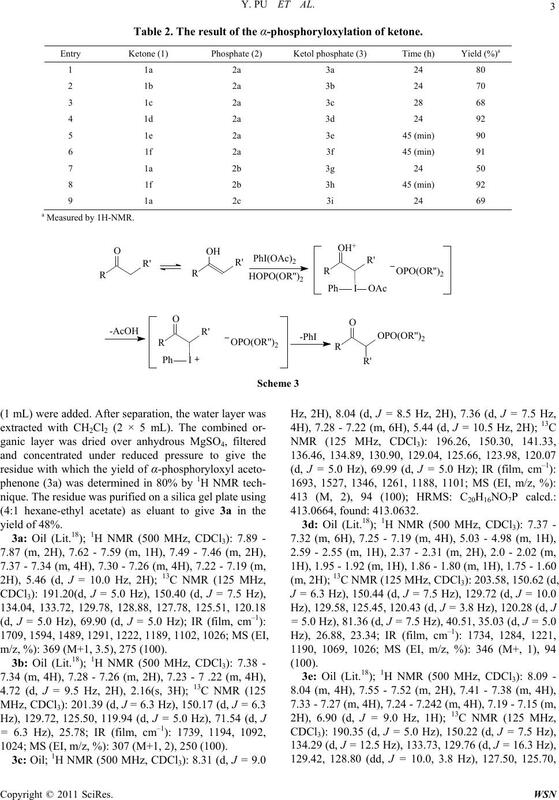 Journal of the American Chemical Society, Vol. 110, No. Vol. 67, No. 12, 2002, pp. 4362-4365. 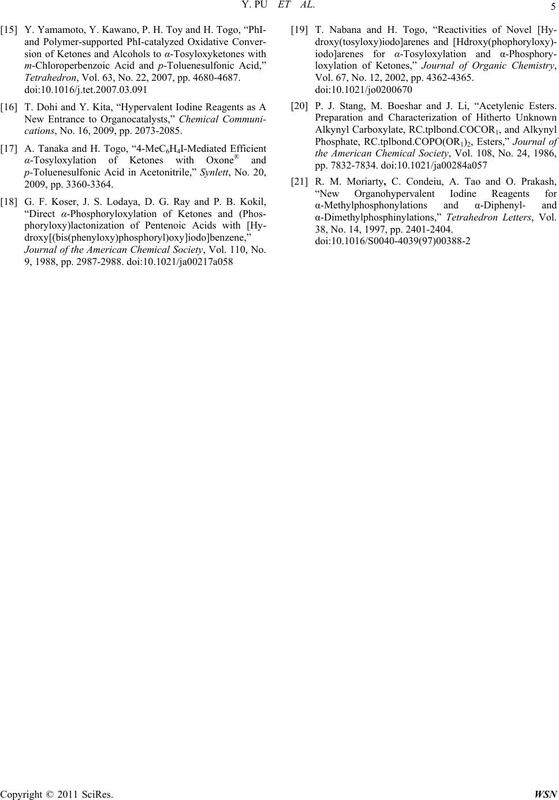 P. J. Stang, M. Boeshar and J. Li, “Acetylenic Esters. 38, No. 14, 1997, pp. 2401-2404.